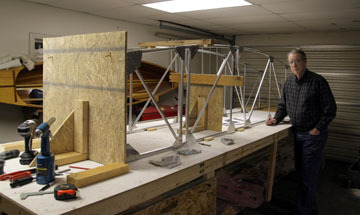 A large roll of Fokker construction paper was purchased in the aviation department of the local Lowes. 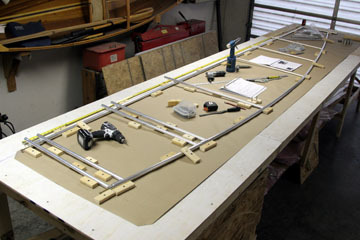 The paper is 35" wide which is just right for building the fuse. The paper was stapled to the bench and a reference line was chalked the length of the bench. This became the location of the top longeron. 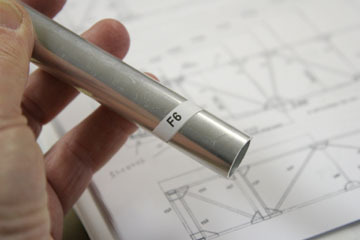 The plans give the dimensions for laying out the fuse components. A drywall square worked nicely for drawing perpendicular lines to the longeron reference so all the fuse stations could be located. Each tube is labeled with a code that corresponds with that station on the fuse drawing. 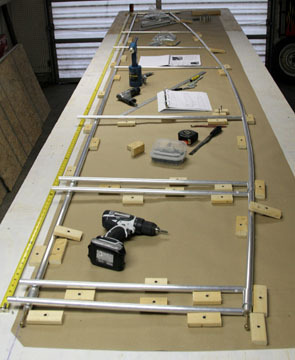 The tubes are slightly over-length to allow for trimming to size. 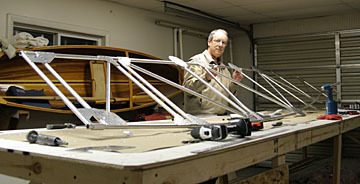 The most demanding task of this session was bending the bottom longerons. The aluminum tubing can be bent cold but getting too aggressive can result in kinks which turn the tubes into large wind chimes. 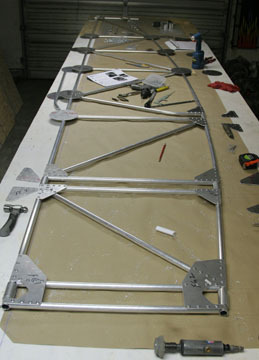 I used the bending form to gradually curve the longeron to fit the dimensions and general shape of the drawing. I decided to make all parts in duplicate so the other fuse side would only need assembly without fabrication. 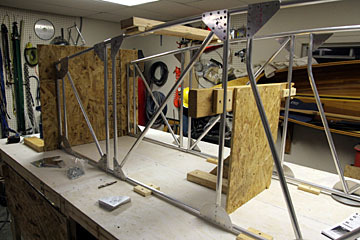 Sleeves for attaching the landing gear and cabanes were also fabricated. Wood blocks and drywall screws locate all the fuse components. This photo shows how the first fuse side looked after an afternoon of work. The longerons are ready for the trimming and insertion of the stations. A cordless drill and hand tools work nicely for building this kit but since I have a full set of air tools I'll be primarily using an air drill and pneumatic riveter. Snowed in today so decided to make it a productive day and put together a fuse half. Biggest problem early in the day was establishing the work flow. Seemed all the tools had to be rounded up, some of them needed to be serviced, and I still needed to study the docs in order to make sure nothing was overlooked. But after an hour or so things started clicking and the old shop habits returned. I drilled the thick gussets on the drill press then drilled and clecoed them in place prior to riveting. The shape of a few of the gussets was tweaked so they would fit better but overall the bits and pieces came together nicely. The biggest change made was to the tail post gussets. 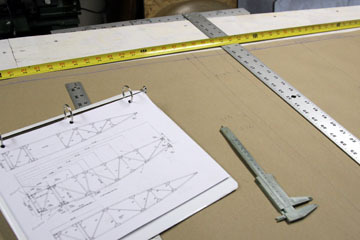 It appears on the plans that they stack on top of the rudder hinges and this results in an awkward fit. I cut reliefs so they would fit around the hinges. Note: Here is a heads-up for D7 builders. The circlular gussets at F12 and F13 are half-gussets. This is not noted on the plans and only becomes apparent after very careful study (or by running out of circular gussets....). This side will be flipped over so the right side can be built on top of it. Not bad for the first day of assembly. Second day of fuse assembly saw the right side go together and both sides jigged for final assembly. The second side was built on top of the first. 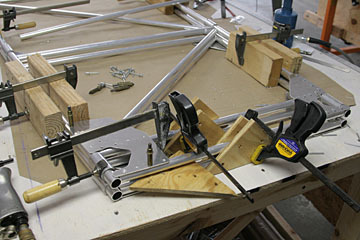 Numerous clamps were employed to keep everything aligned so both sides would be a good match. Here is a clever mod to a common clamp (not my original idea). 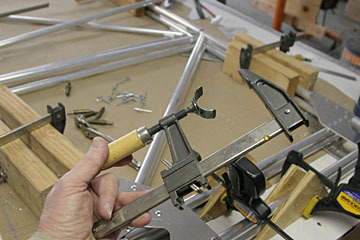 A section of 4130 tubing was welded to the clamp so it can securely clamp tubing. Works like a charm! 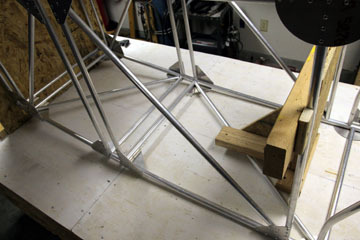 After the second side was completed, a simple fixture was built to hold both sides square and level. 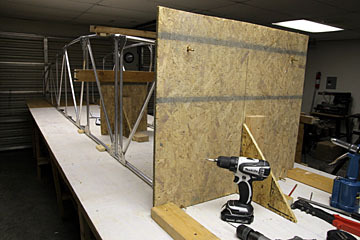 A "firewall" was made from a piece of the shipping crate and very carefully leveled and plumbed on a centerline chalked on the bench. The engine mount bolts are attached to the firewall which holds the two sides perfectly square. 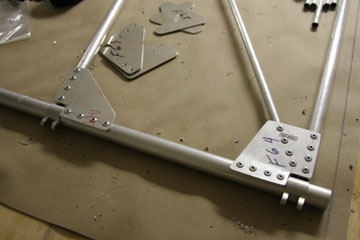 A second fixture holds the mid-section of the fuse square and plumb. Everything is now very rigid and ready for addition of cross-members and diagonals on the bottom of the fuse (top longerons on the bench). 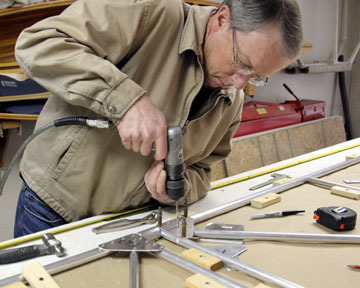 This fixture will be reused when it is time to flip the fuse over for the top cross-members and diagonals. 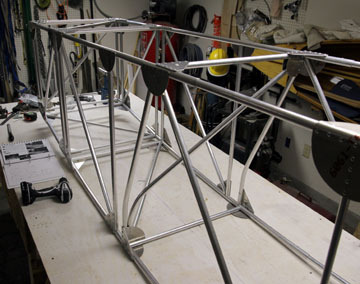 Crossmembers and diagonals in the forward section of the fuse bottom are now in place. The fuse jig is working as planned. Fuse has been flipped over so forward members of fuse top can be installed. The fuse is getting stiffer and the tubing pile is diminishing! Completed installing the forward fuse stations and diagonals. Next step is to re-jig the fuse for completion of the aft fuse.